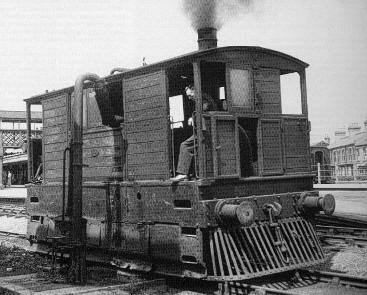 The Wisbech & Upwell Tramway was a small railway that enjoyed and continues to enjoy a level of fame out of all proportion to its size. The tramway was unusual due to it being a roadside steam tramway. Although more common in Ireland and on the Continent, roadside steam tramways were rare in Britain. The line also enjoys a degree of fame due to the unusual steam trams that it operated for much of its life, and have now been immortalised in the Rev. W. Awdry "Railway Stories" (aka. Thomas the Tank Engine). The Wisbech & Upwell was built to carry agricultural produce in the Wisbech area of East Anglia. Incoming traffic was principally coal, with outgoing traffic consisting of vegetables, fruit, and in later years flowers. It has been commented that it was the only railway in Britain to operate on the principle of "coal in, potatoes out"! Opened in 1883, it enjoyed a certain degree of prosperity until the 1950s when lorries impacted the traffic in a big way. Listed on Dr. Beeching's list of lines to be axed in 1962, it won a reprieve but finally closed on 23rd May 1966. The unusual locomotives were a direct result of the Board of Trade's tram restrictions which demanded speed restrictions, controls at both ends, and the fitting of cowcatchers and skirts over the wheels. With a wooden body fitted, the end result was a locomotive that resembled a brake van. Next Page: History of the Wisbech and Upwell Railway.